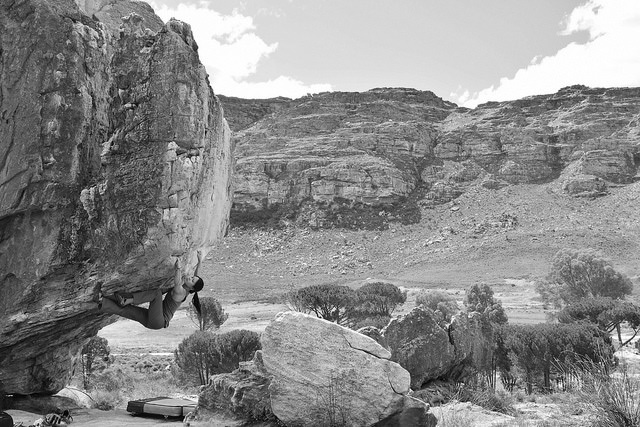 Let’s take one classic climb in Joe’s Valley, Utah: The Angler, one of the most beloved boulder problems in one of the most beloved bouldering regions in the world. As it turns out, it’s not that interesting to watch somebody climb it. First of all, non-climbers tend to like to watch really explosive and spectacular movement. During competitions on artificial rock, lay audiences will cheer for big jumps from one huge hold to another. The Angler has none of that; it’s slow, plodding, and careful. Experienced climbers tend to like watching subtle, intricate movement, but even then, it’s best when the movement is visible – when you can see the re-balancing, the yoga-like stretches, the interesting body postures. But none of the interesting stuff is visible in The Angler. It’s very gradual, delicate climb, with a slopey, slippery ridge for your hands, and tiny invisi-feet. The difference between success and failure depends on minuscule shifts of balance – it depends on maintaining your core tension, on controlling your centre of gravity and inching it around with painstaking care. And, when you do it right, it feels unbelievably good – it feels like you’re a thing made of pure precision, a scalpel of delicate movement, easing your way up the rock. But, to somebody watching from outside, it looks… like nothing. Even for an experienced climber, it’s pretty boring to watch somebody else climb this thing. I love The Angler to death, but I’ll admit: I’ve sat with a beer by the river next to it and tried to watch people climbing it and gotten bored almost instantly. In this particular climb, all those fascinating internal movements are invisible to the external eye. 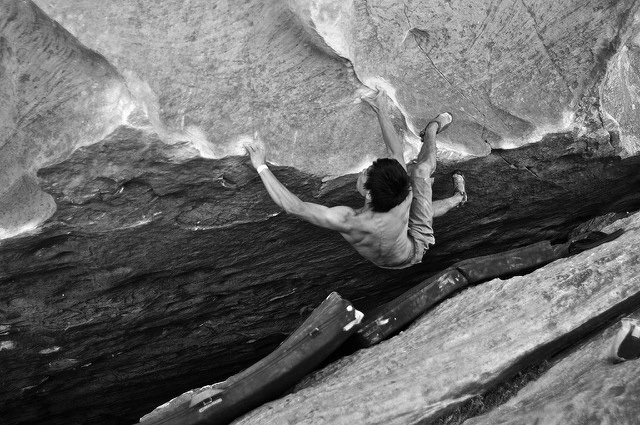 The aesthetics of movement, here, are for the climber alone. C. Thi Nguyen is assistant professor of philosophy at Utah Valley University, and works on epistemology, aesthetics, and games. This piece applies theory from a work in progress. In choosing for his recent series of paintings the title “The Aesthetics of Death,” Alberto Rey invites us to consider his works not only as meditations on life and death (already an ambitious project), but also as participants in the long-running philosophical dialogue on the nature of aesthetics. This title also calls attention to aspects of the paintings that relate them to some of his earlier works in surprising ways. Initially, the title seems like on odd fit for the works in question, relatively naturalistic representations of steelhead trout in varying states of decay; instead, one might have expected to see human corpses, perhaps, or skulls, gravesites, even weapons of war. Indeed, the juxtaposition of a universalizing title with such a specific and relatively commonplace subject matter almost seems counterintuitive. Yes, the fish are dead, and they are obviously painted, thus objects of aesthetic contemplation; yet, since the series is not called something like “The Aesthetics of Dead Trout,” viewers are encouraged to see the steelhead as broader metaphors, not merely for death in general, but for the aesthetics of death in general. But what exactly does that mean? Does it suggest an attempt to find beauty in death? Or might it be a more loaded way of describing the visual characteristics of death? Might it even imply some characteristic of aesthetics that relates to death? 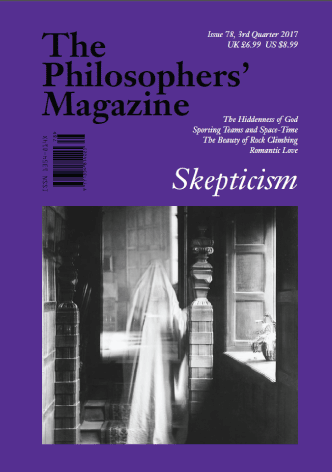 That last question leads to a further series of debates, as few terms are as widely contested in the history and criticism of art as “aesthetics.” As suggested by the term “anti-aesthetic,” most famously used by Hal Foster as the title of one of the earliest and most well-known anthologies of essays dealing with the topic of “postmodernism” in the early 1980s, art critics and historians often associate the term “aesthetics” with the general strain of aesthetics popularly known as “art for art’s sake,” and more specifically the brand of formalism practiced by the critic Clement Greenberg, derived in turn from the 18th century philosophy of Immanuel Kant. Coming from a perspective highly influenced by the Frankfurt School and (to a lesser extent) certain strains of poststructuralism, the “anti-aesthetic” and “postmodernist” critics mainly objected to a conception of art as an autonomous sphere of human activity, detached from material, social, and political concerns. Kant, on the other hand, had defined aesthetic judgment as radically distinct from both individual interest and social utility. Although Kant’s discussions of aesthetics did not specifically involve art—his examples were mainly natural objects, such as flowers—Greenberg’s mid-twentieth century definition of modernism in art emphasized not only the autonomy of art itself from individual and social interests, but also that of each individual artistic medium in relation to others. While he insisted that his framework was merely descriptive rather than prescriptive, its teleology was inescapable: to the extent that it was modernist, each medium tended to divest itself of all traits or characteristics not “proper” to it (that is, not belonging to some other medium). In the case of painting (his preferred medium), its “proper” characteristics were flatness, (two-dimensional) shape, and “opticality.” Other traits formerly common to painting, such as narrative, three-dimensional illusionism, or even texture, were more “proper” to other media and therefore to be avoided in painting (or, at least, in “modernist” painting). If Greenberg’s notoriously apolitical (and therefore, according to some, implicitly conservative or even reactionary) formalist aesthetics are the primary target of the critics associated with the “anti-aesthetic,” the latter term itself implies that more is at stake than formalism: in labeling their positions “anti-aesthetic,” such critics would appear to disassociate themselves from virtually any conception of art as a special or separate sphere of activity (notwithstanding the immediate objection that an aesthetics of negation as implied by the term “anti-aesthetic” is in itself an aesthetic). In the wake of Foster’s anthology and the dozens of similar projects that followed throughout the 1980s and beyond, more recent books with such titles as Uncontrollable Beauty: Toward a New Aesthetics; Sticky Sublime; Art History, Aesthetics, Visual Studies; and Art History Versus Aesthetics show signs of a renewed interest in aesthetics and its complex relationship with the history and criticism of art. Rey’s title, “The Aesthetics of Death,” then, enters his series into a minefield of contested territory, all the more provocatively so because of some pointed allusions to Greenberg (which may or may not be intentional) in several of the paintings. In light of Greenberg’s long and passionate promotion of non-figurative abstraction, to claim a Greenbergian reference in such insistently figurative paintings may seem questionable. Yet, because of both the shape of the fish and the point of view from which they are depicted, the paintings literally foreground the very qualities that Greenberg emphasized in his formalist readings of abstract expressionist canvases: flatness, “allover” composition, and the reinforcement of the shape of the support. In spite of Rey’s illusionistic technique, he uses it to depict not a three-dimensional space, but flat objects spread out against an equally, even insistently, flat background. We view the lifeless fish as if from directly above, their flat bodies perfectly framed by their rectangular supports and pressed flush against the picture plane. Although, on the one hand, the trout clearly form figures against a background, on the other, their flatness in conjunction with the equally flattened stones and sandy areas making up their final resting places simultaneously resists the illusion of three-dimensionality. In the third version, the markings on the steelhead mimic both the shape and color of the flat stones, further deemphasizing the foreground-background contrast, while in the fourth version, the broken up fish corpse wraps around the more loosely arranged stones to the point of becoming nearly indistinguishable from them. Similarly, in versions one and two, the fishes’ tails blend in perfectly with the background colors, adding to the conflation of figure and ground. The stones in the second version, moreover, make up the entirety of its background, extending beyond the frame in all directions. This hints at the “allover” form of composition that Greenberg recognized in both Jackson Pollock’s drip paintings and the late works of Claude Monet, whereby the entire surface of the canvas becomes an evenly spread out foreground with little or no sense of contrasting background. These folk paintings were visual prayers made for specific saints or religious figures. I was intrigued by how the artists managed to create a relationship between their everyday lives and a sense of spirituality through their art. I wanted to create my own series of work that brought this sense of spirituality into my everyday life. Ironically, the physical “presence” of an altarpiece—its quality as an object of everyday life—is precisely what would disqualify it for Fried’s resolutely idealist “grace.” But this physical presence is exactly what Rey foregrounds through his structured supports. Both this physical presence of the art object and its potential references to altarpieces, moreover, begin to call attention to the multiple paradoxes of Rey’s title, “The Aesthetics of Death.” In painting, the steelhead are made present, but their very presence in painting implies their absence in the phenomenal world; this play of presence and absence may be said to be true of any representation, painted or not. However, by representing dead creatures rather than living ones, Rey seems to be engaging this representational ambivalence in a remarkably direct way: he brings the dead back to life, but only in that odd eternal life of the painted object. As uncanny as this zombielike aspect of representation may be in the genre of portraiture, these paintings actually reference the arguably even more uncanny representational form of the mounted trophy fish, forever hanging on the wall as a frozen monument to the fisherman’s skill, luck, and bravery—and possibly, ironically, to the life of the fish itself: life and vitality, celebrated by means of a dead body kept eternally alive as a flat and lifeless object. When I earlier asked, rhetorically, whether Rey’s title suggested aspects of aesthetics that relate to death, the type of oscillation between life and death brought into play by these fishing trophies is mainly what I has in mind. But such memorials are not normally considered to be works of art, and one might wonder whether their effects could be possible in art, in the absence of the actual, once-living bodies that characterize the mounted displays. As my earlier reference to portraiture might suggest, I do believe that most works of representational art engage in a similar phenomenological back and forth movement, though it may be less striking than in the case of the aforementioned trophies (and similarly uncanny objects such as the animatronic figures of Disneyland’s “It’s a Small World”). Even in the case of nonfigurative abstraction, it is hard to escape the sense that something, whether an artist’s emotional state or even a concept, is attempting to achieve immortality in the stillness of the work. On some level, this sense of immortality is one of the targets of the “anti-aesthetic” aesthetic, although the degree to which even the most contingent or ephemeral works or performances can escape at least some intimation of the deathly stillness of representation is open to debate. This play of life and death, presence and absence, in the work of art has been the subject of much psychoanalytically informed criticism. Paraphrasing Jacques Lacan, Steven Levine describes this characteristic succinctly: “Art neither succeeds in representing the presence of the object of desire under the guise of imitation nor does it simply fail to represent it and thereby yield only its absence. The affirmation of a negation, art represents the Thing’s presence […] in the very phenomenality of its absence, as its absence.” Again, while such descriptions may be applicable to all works of art, I would argue that Rey’s works further heighten this aesthetic paradox through their oscillation between three-dimensional illusionism, formal intimations of flatness, and the three-dimensional objecthood of their altarpiece-like supports. Over the past decade, I started to analyze why these lifeless forms affected me. With each body I documented, I tried to estimate their age, their genetic background and the life they led over the past few years. As I looked more closely at the remains, I would search for details that would indicate what had led to their demise. I often saw these deserted or discarded bodies as metaphors for my own life. The majestic creatures that had, at one time, led noble battles in their attempts to survive and prosper. They now had become silent still-lives that were slowly being broken down by the same elements that had supported them. There seemed to be a sad irony and elegance to the cycle. While Rey’s references here to “still-lives” and even “elegance” may suggest a potential formalist reading of the steelheads’ decaying bodies as abstract shapes in a carefully arranged composition, his emphasis on their previously lived existence, as well as their relevance as metaphors for his own life experience, considerably complicate such a reading. Certainly, Rey’s experience of his own work does not even come close to meeting Kant’s primary condition for purely aesthetic judgment: that is, disinterest on the part of the observer. For Kant, the actual existence in the world of an object—let alone the existence of something represented on or by such an object—should have absolutely no relevance to any judgment of its aesthetic merits. For Rey, on the other hand, the fact that these corpses once lived is crucial: he identifies with the fish and relates them to his own life. Rey’s interest in the life and death of steelhead trout, moreover, extends well beyond the subjective reflection suggested by the previously quoted statements: his website, in addition to detailing his artistic projects, also contains a link to the youth fly fishing program in which Rey participates. Not only does Rey involve himself directly in the life cycles of the fish he represents, but this very involvement also connects him to his community and to the lives of its children. In 1998, I returned to Cuba for the first time in 36 years. I experienced the real difference between “nostalgia” and “reality.” Apart from the Balsas series, my work of the last fifteen years had dealt with a romantic vision of the past and the present. […] After that trip to Cuba, I saw everything around me quite differently. […] The new work would combine my interest in biology, the lost artistic notion of realism, and fish. […] As most of our social and economic reliance had moved to an urban setting, the connection between nature and culture in contemporary society seemed to have been lost over the last few generations. This series would try to mend the lost connection by presenting painting of fish and landscapes that were characteristic to a specific region. While Rey does not explicitly connect all of the dots here between his return to Cuba and the new direction he would take in his art, his comments invite us to speculate that the sense of lost connections to nature that he is concerned with in the “Biological Realism” series is related in some way to the loss of the Cuba that he had imagined for 36 years. Likewise, his focus here on realism, which would seem to extend to the grim realities explored in the “Aesthetics of Death” series, may be related to the replacement of his romantic vision of Cuba with that of a more sobering reality. Even in being excised from the literal, figurative subject matter of his recent work, Cuba, its memory, and its connection and disconnection to the artist seem to haunt these works in subtle and not so subtle ways. While I claimed earlier that the “Aesthetics of Death” series seemed to evoke a formalist aesthetic in its flatness and careful orientation to the picture plane, the paintings nevertheless cannot be understood as self-contained exercises in form; instead, these works are also connected to a range of external contexts, from the impact of human society on nature to the artist’s ambivalent relationship to his homeland, or the nineteenth-century American tradition of rugged marinescapes and piscatorial imagery to contemporary debates on the nature and status of painting. In the context of this series, I cannot help but think of these multiple, sometimes barely visible, connections as fishing lines. Fly fishing, after all, can be understood to involve an aesthetics—indeed, an aesthetics of death—but its aesthetics of death is simultaneously an aesthetics of connection and engagement. Like the back and forth battle between a fisher and his or her prey, Rey’s aesthetics oscillate between autonomy and involvement, absence and presence, death and life. And if the “Aesthetics of Death” presents death not as a definitive ending, but part of a cyclical pattern of life, these works should give much comfort to those who may be concerned about what sometimes appears to be the “death of aesthetics” in contemporary art critical discourse. The Anti-Aesthetic: Essays on Postmodern Culture, ed. Hal Foster (Seattle: Bay Press, 1983). Immanuel Kant, The Critique of Judgment (1790), trans. James Creed Meredith (Oxford and New York: Oxford University Press, 1952). See especially “Analytic of the Beautiful,” 41-89. While Greenberg’s position developed over the course of several essays, it is most famously and succinctly argued in “Modernist Painting,” Arts Yearbook no. 4 (1961), reprinted in The New Art: A Critical Anthology, ed. Gregory Battcock (New York: E.P. Dutton, 1973) 66-77. Uncontollable Beauty: Toward a New Aesthetics, ed. Bill Beckley with David Shapiro (New York: Allworth Press, 1998); Sticky Sublime, ed. Bill Beckley (New York: Allworth Press, 2001); Art History, Aesthetics, Visual Studies, ed. Michael Ann Holly and Keith Moxey (New Haven and London: Yale University Press, 2002); Art History Versus Aesthetics, ed. James Elkins (New York and Abingdon, UK: Routledge, 2006). See Clement Greenberg, “‘American-Type’ Painting,” in Modern Art and Modernism: A Critical Anthology, ed. Francis Frascina and Charles Harrison (New York: Harper & Row, 1982), 93-103. Michael Fried, “Art and Objecthood,” in Minimal Art: A Critical Introduction, ed. Gregory Battock (New York: E. P. Dutton & Co., 1968), 116-47. While the “white cube” designation is nearly ubiquitous in contemporary art discourse, its most influential analysis is offered in Brian O’Doherty’s Inside the White Cube: The Ideology of the Gallery Space (1976) (Berkeley, Los Angeles, and London: University of Claifornia Press, 1999). Steven Z. Levine, “Between Art History and Psychoanalysis: I/Eye-ing Monet with Freud and Lacan” in The Subjects of Art History: Historical Objects in Contemporary Perspective, ed. Mark A. Cheetham, Michael Ann Holly, and Keith Moxey (Cambridge, New York, and Melbourne: Cambridge University Press, 1998), 197-212; 204 (emphasis original). “Now, where the question is whether something is beautiful, we do not want to know, whether we, or any one else, are, or even could be, concerned in the real existence of the thing, but rather what estimate we form of it on mere contemplation (intuition or reflection). […] One must not be in the least prepossessed in favor of the real existence of the thing, but must preserve complete indifference in this respect, in order to play the part of judge in matters of taste.” Kant, 42.